I love soup! I love how easy it can be to prepare a big pot of soup from scratch and enjoy for several nights! Or how it can be frozen for meals later in the season! I love how soup can also be used to turn leftovers into an entirely different meal, often stretching those leftovers into another night or two! Something that comes in handy during this bad economy! Or how warm and satisfying a bowl of hot soup can be after being out on a cold day! 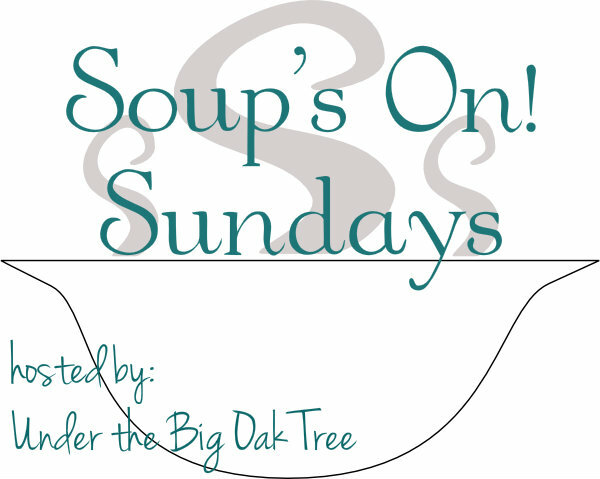 All of the reasons listed above is why I am always on the search for new soup recipes and why I invite you to join me each Sunday (starting next week) and link up your favorite soup recipes! It can a new favorite or an older post of one of your best tried and true soup recipes! The first Soup's On! Sunday blog carnival will be posted on Sunday, November 4th! So, mark your calendars and tell your friends! 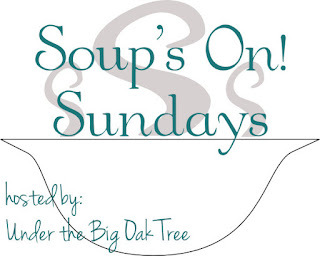 Be sure to come back and share links to your best soup recipes for us all to try and enjoy during the cold winter we'll be heading into soon! Hopefully, by then, I'll figure out how to set up a linky party and also come up with a cool logo for the party! Even though the party doesn't start until next weekend, I still wanted to share a soup recipe that we enjoyed this past week! I always thought of myself as someone that loved vegetables. In my teens, I've been known to fill my plate with just veggies and not even miss the meat portion of the meal, especially if we were having a meat dish that I wasn't particularly fond of back then. As much as I loved vegetables, I never strayed very far from the basics: mashed potatoes, peas, corn, carrots, green beans. I hated broccoli and cauliflower and usually picked the peppers and onions out of anything my mom prepared. (Sorry, mom!) As I grew older, my tastes have sure changed. I now love all of those veggies I tried to avoid all those years. Still, there are so many different veggies I haven't tried yet! On the first day of autumn, my friend Diahanna and I took our girls to the local dairy farm for ice cream. While we were there, the girls posed for pictures, picked out pumpkins and of course, ate some delicious ice cream! Feeling festive, I grabbed a spaghetti squash and an butternut squash when I paid for Grace's pumpkins. I already knew what I wanted to make with the spaghetti squash. I had no plans at all for the butternut squash. I had never cooked with nor have I eaten butternut squash before, but I've seen it mentioned so many times in recipes on blogs and all over Pinterest. Since I love soup, it only made sense for me to look for a soup recipe to test out the new-to-me squash! 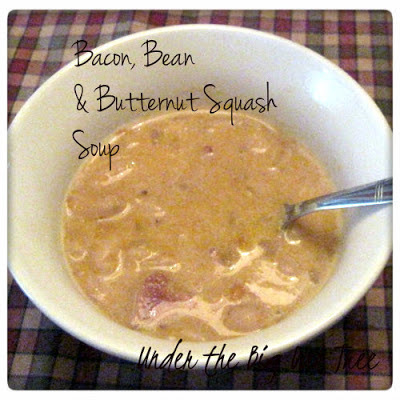 I posted a list of soups that I want to try this season and one of the soups mentioned was this Bacon Butternut Squash Soup. I knew I wanted to make a few changes to accommodate our tastes as well as use items mostly found in our pantry. The result was a wonderfully flavorful soup that I enjoyed very much! Cut butternut squash in half. Scrape with a spoon to remove seeds. Place squash halves flesh side down in a baking dish. Add about a cup of water to the baking dish. Bake in oven for 30 minutes or until squash skin is tender and easily pierced with a fork. Slice butter and place into a large bowl. When squash is cool enough to handle, scrape the flesh from the shell into the bowl with the butter. Add syrup and salt and mash with a potato masher. Using an immersion blender or a food processor, puree squash mixture and set aside. In a soup pot or dutch oven, cook bacon over medium-high heat until cooked through. Drain if necessary. Add onion, cook for another minute or two. Slowly stir in chicken broth, scraping the sides of the pot to remove browned bits. Cover and reduce heat. Allow to simmer for 5-10 minutes. Stir in the butternut squash puree and the cannellini beans. Simmer uncovered for another 5 minutes. Add the cream and salt and pepper, stirring to combine. It seems like a lot of steps for a simple soup, but that's because I included the Butternut Squash Puree recipe as well. The original recipe called for frozen puree from the grocery store, but since I had a fresh squash here that needed to be used, I didn't see the sense in purchasing a bag of frozen puree. Instead, I prepared a homemade puree using the Pioneer Woman's Butternut Squash Puree recipe as a guideline. I reduced the amount of syrup and butter in the recipe. Honestly, the squash has such a lovely flavor that the I'll probably just omit the butter completely next time. I left out the greens that were included in the original soup recipe as well and added an additional can of beans for a heartier soup. I really wasn't sure of how I was going to like the bean and squash combo, but in the end, I really liked the way the soup turned out. The final change in this recipe was the turkey bacon. The original recipe called for regular bacon. I didn't have any int he freezer and really didn't want to add it to the shopping list since it wasn't on sale this week. To me, turkey bacon tastes more like ham than bacon. But that's okay because ham, Canadian bacon or even some smoked kielbasa would be tasty alternatives to the real bacon in this delicious soup! Delicious Dishes hosted by It's a Blog Party! It is SO chilly today, this sounds delicious. Yum. That sounds good to me! I love all of these ingredients but never thought to put them all together. Sounds fabulous! Yum, this sounds perfect for Fall. And I never would've guessed you put pancake syrup in it! Looks amazing and a great thing to keep in your freezer when things like, let's say. hurricanes strike! comfort food and good emergency food. I'm not a huge bacon fan. Have you tried making it without the bacon? Does it turn out okay? I would love to try it! looks so yummy, thanks for the recipe, I also love squash so I might try this in the future. Looks like a yummy dish! Especially with all the wind and rain outside right now!!! Oh, this looks delicious! Perfect for these cold winter days! This soup looks like pure comfort. I am looking forward to your party on Sunday, it will be so much fun. Hope you are having a great fall weekend and thank you so much for sharing with Full Plate Thursday.